What Does Keyed Alike Mean? Abus Diskus Padlocks are suitable for a wide range of internal and external applications. The disc padlock is a special form of padlock with distinct advantages over conventional padlocks. 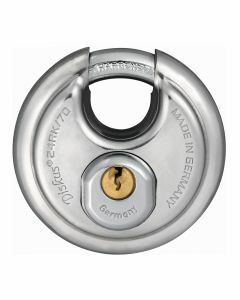 The disc shape itself effectively eliminates the most common approaches of forcing a padlock open. The effective design means that there is only a very small opening in the shackle, which in turn makes this padlock very difficult to tamper with. As the Abus Diskus Padlock is made mainly of stainless steel, it is used especially where security and protection against corrosion is required. 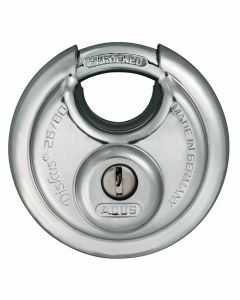 The original Diskus Padlock is only available from Abus. Disclaimer: ABUS Padlocks Online are in no way connected, or part of ABUS. We are a separate company trading in ABUS product. For any queries relating to the product bought or ordered from us, please ring the "ToolChimp" number above (01376 346197), or email us here.